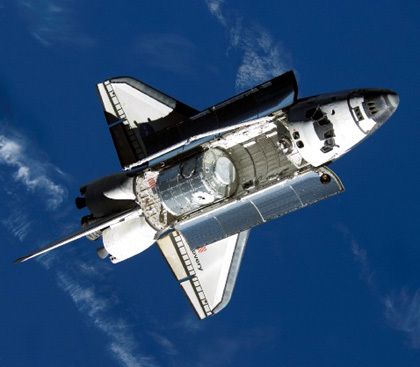 The Discovery space shuttle is expected to return to Earth on Wednesday (photo by nasa.gov). The space shuttle Discovery, which has been in space since Feb. 24, is expected to return from its last mission on Wednesday, signifying the retirement of the 30-year space shuttle program. As NASA‘s $19 billion budget for 2011 will require it to set aside plans for manned missions in the near future and transition to commercially built vehicles, members of the Elon community respond with some opposition. “Even if we didn’t make any discoveries in space, the fact that we go up there has given us many innovations on Earth,” said Helen Walton, member of the Elon mathematics department. NASA has spent $9 billion planning manned missions, but budget for 2011 has caused any plans to come to a standstill, a move that some believe will negatively affect the U.S.
Elon junior Casey Kasko agrees, believing space exploration is important for future generations as well. Aramark employee Pat McCaskill believes changes in budget should happen across the board. Elon sophomore Nick Butterly thinks the U.S. should spend its money elsewhere for the time being. Sophomore John Cart believes there are alternatives. In the coming year, $6 billion of the budget will be used to support commercially built space vehicles.